The art of Bagua circle walking dates back hundreds of years when Daoists would walk in circles to calm their mind as a form of meditation. The early Daoists repeated a mantra while walking the circle slowly with relaxed, comfortable and natural body movements. What Is a Bagua Circle? There are many different styles, methods and postures of circle walking. Some practitioners walk the circle in a frontwards direction, others walk backward and still, others rotate direction at various times. Speeds vary from very slow to extremely rapid and postures range from a full upright position to a low body squat with thighs parallel to the ground. Walking circles can be on any surface such as dirt, bricks or sand and are often part of a feng shui garden landscape. Just as the early Taoists practiced the art of circle walking bringing harmony to their minds and bodies, many practitioners of today still follow this same method of meditation. When circle walking for the purpose of meditation, the practitioner walks at a slow to moderate pace with steps that are steady, fluid and even. Throughout the exercise, breathing remains smooth and relaxed as the circle walker focuses on a pole or object placed in the circle's center. Using a mantra is up to the practitioner. Most beginners find it helpful to draw a real circle for their practice. You can create a circle that is around six or eight feet in circumference (larger if you prefer). As you advance in your practice, the circle you use will become smaller and smaller. You will also add more advanced movements and techniques as you tighten the circle, decreasing it in size. When walking the circle, focus on the center of your body, the waist and hip regions for the power to move your lower and the upper body. First-time walkers simply walk in a normal walk around the circle. This type of walking advances in a second type of walking that is slightly more focused on foot movements until the student reaches the third level known as mud walking. This stage of circle walking prepares the student for the Tai Chi movements used in Bagua Zhang martial arts that are introduced in the fourth level of Bagua circle walking. Start walking the circle by positioning your feet along the line of the circle. Moving clockwise, your right heel will be positioned touching the inside of the circle. Your left heel will touch the outside of the circle. You want to move with your hips, not your legs. Stand with your heels together with the line of the circle running between them. 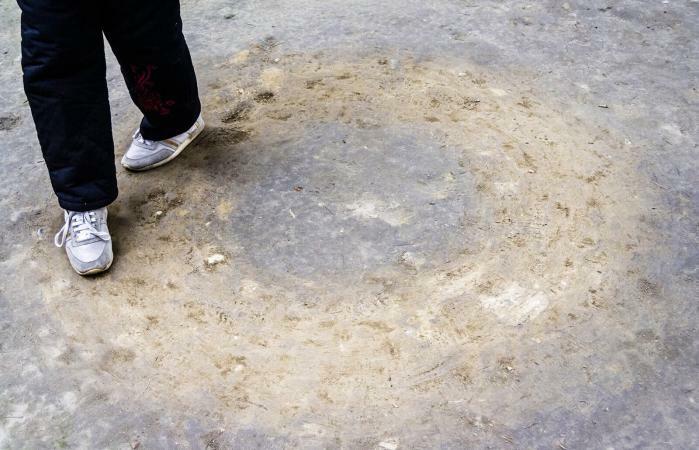 This is how you want your feet to straddle the circle as you walk the Bagua. One foot on the outside and one on the inside of the circle as close to the circle line as possible. You will always keep your weight on your heels never your toes or balls of your feet as you move around the circle. Your body weight will sink down with each step forward and rise up as you bring your other leg sliding forward and sinking down again. Your hips should open with each movement, thrusting your legs forward. The walk begins with the inside foot (right foot) in a sliding movement forward along the inside of the circle rim (clockwise motion around the circle). End this first step with your right heel still on the inside of the circle line as you bring your left foot sliding forward with heel resting on outside of the circle. This step is completed when you bring the left foot sliding toward the right along the outside of the circle rim so your two feet are briefly together as you slide the left foot forward. Your weight should remain on the heels of your feet. You will repeat this movement as you make your way around the circle. This is called mud walking since it resembles your feet sliding in mud as you walk around the circle. To change direction, you simply pivot on your heels, repositioning your feet so the right foot is now on the outside of the circle circumference and the left foot travels around the inner rim of the circle. As you train in walking the Bagua circle, your movements will become more fluid. When first learning, you want to keep your arms relaxed by your sides. Later, you can add various positioning of your arms in various animal poses, such as the bear or snake. When a practitioner walks a circle with the main purpose being the cultivation of chi, it is important to maintain a strong, calm sense of focus and concentration. Doing so allows the chi to gather in the dan tian which is an area inside the body several inches below the navel. This type of bagua walking requires the same mental focus and breathing as meditative circle walking. However, the pace is quicker with more complex steps, posturing, and directional changes. Although it is based on the ancient philosophy of the I Ching, Bagua Zhang is one of the newest forms of martial arts. The art of Bagua Zhang, together with the arts of Xingyiquzn and Taijiquan, are all part of the Nei Jia Quan school of martial arts, known as Internal Family Boxing. Each of these art forms has deep roots in Taoist meditative practices, practices that cultivate Chi and the meaning and philosophy of yin-yang. Credited with the creation of Bagua Zhang more than one hundred fifty years ago, Dong Haichin adopted the early Taoists practice of meditative circle walking as a fundamental aspect of Bagua Zhang. Becoming adept at Bagua walking allows the practitioner to create a sense of mental calm and stillness while being physically involved in an intense activity. Once mastered Bagua Zhang gives practitioners the ability to change energy patterns as described in the classic Book of Changes, also known as the I-Ching. Bagua walking as an exercise for Bagua Zhang involves both meditative and chi cultivation practice. In addition, the practitioner learns complex footwork, body postures, and arm movements. Deeply rooted in Taoist tradition, Bagua circle walking has evolved into the basis of one of the most popular martial arts, Bagua Zhang. The more you practice walking the Bagua, the greater the benefits you reap for this discipline.